For other uses, see Guangzhou (disambiguation). "廣州" redirects here. For the South Korean city with the similar Hanja spelling 廣州, see Gwangju, Gyeonggi. Guangzhou (simplified Chinese: 广州; traditional Chinese: 廣州; Cantonese pronunciation: [kʷɔ̌ːŋ.tsɐ̂u] or [kʷɔ̌ːŋ.tsɐ́u] ( listen); Mandarin pronunciation: [kwàŋ.ʈʂóu] ( listen)), also known as Canton, is the capital and most populous city of the province of Guangdong in southern China. On the Pearl River about 120 km (75 mi) north-northwest of Hong Kong and 145 km (90 mi) north of Macau, Guangzhou has a history of over 2,200 years and was a major terminus of the maritime Silk Road, and continues to serve as a major port and transportation hub, as well as one of China's three largest cities. Guangzhou is at the heart of the most-populous built-up metropolitan area in mainland China that extends into the neighboring cities of Foshan, Dongguan, Zhongshan and Shenzhen, forming one of the largest urban agglomerations on the planet. Administratively, the city holds sub-provincial status and is one of China's nine National Central Cities. At the end of 2018, the population of the city's expansive administrative area is estimated at 14,904,400 by city authorities, up 3.8% year from the previous year. Guangzhou is ranked as an Alpha global city. There is a rapidly increasing number of foreign temporary residents and immigrants from Southeast Asia, the Middle East, Eastern Europe and Africa. This has led to it being dubbed the "Capital of the Third World". The domestic migrant population from other provinces of China in Guangzhou was 40% of the city's total population in 2008. Together with Shanghai, Beijing and Shenzhen, Guangzhou has one of the most expensive real estate markets in China. In the late 1990s and early 2000s, nationals of sub-Saharan Africa who had initially settled in the Middle East and other parts of Southeast Asia moved in unprecedented numbers to Guangzhou, China in response to the 1997/98 Asian financial crisis. 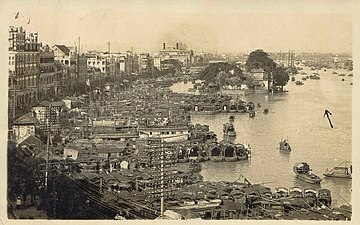 Long the only Chinese port accessible to most foreign traders, Guangzhou fell to the British during the First Opium War. No longer enjoying a monopoly after the war, it lost trade to other ports such as Hong Kong and Shanghai, but continued to serve as a major entrepôt. 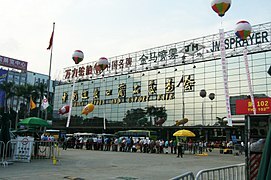 In modern commerce, Guangzhou is best known for its annual Canton Fair, the oldest and largest trade fair in China. For three consecutive years (2013–2015), Forbes ranked Guangzhou as the best commercial city in mainland China. A Qing-era portrait of the Grotto of the Five Immortals, the Taoist temple around the five stones which gave Guangzhou its nickname "The City of Rams". 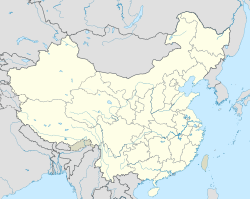 Guǎngzhōu is the pinyin romanisation of the Chinese name 廣州, which was simplified in mainland China to 广州 in the 1950s. The name of the city is taken from the ancient Guang Province (Guang Zhou), after it had become the prefecture's seat of government, which is how some other Chinese cities, including Hangzhou, Suzhou, and Fuzhou got their names. The character 廣 or 广—which also appears in the names of the provinces Guangdong and Guangxi, together called the Liangguang—means "broad" or "expansive" and refers to the intention to dispense imperial grace broadly in the region with the founding of county of Guangxin in Han Dynasty. Before acquiring its current name, the town was known as Panyu, a name still borne by one of Guangzhou's districts not far from the main city. The origin of the name is still uncertain, with 11 various explanations being offered, including that it may have referred to two local mountains. The city has also sometimes been known as Guangzhou Fu or Guangfu after its status as the capital of a prefecture. From this latter name, Guangzhou was known to medieval Persians such as Al-Masudi and Ibn Khordadbeh as Khanfu (خانفو). Under the Southern Han, the city was renamed Xingwang. The Chinese abbreviation for Guangzhou is "穗" (although the abbreviation on car license plates, as with the rest of the province, is 粤), after its nickname "Rice City". The city has long borne the nickname City of Rams or City of the Five Rams from the five stones at the old Temple of the Five Immortals said to have been the sheep or goats ridden by the Taoist culture heroes credited with introducing rice cultivation to the area around the time of the city's foundation. The former name "City of the Immortals" came from the same story. The more recent City of Flowers is usually taken as a simple reference to the area's fine greenery. 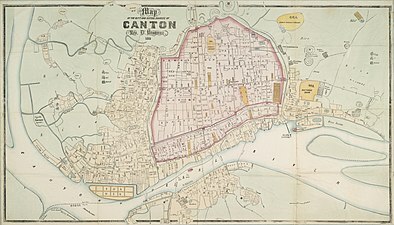 The English name "Canton" derived from Portuguese Cantão or Cidade de Cantão, a muddling of dialectical pronunciations of "Guangdong" (e.g., Hakka Kóng-tûng). Although it originally and chiefly applied to the walled city, it was occasionally conflated with Guangdong by some authors. It was adopted as the Postal Map Romanization of Guangzhou and remained in common use until the gradual adoption of pinyin. As an adjective, it is still used in describing the people, language, cuisine and culture of Guangzhou and the surrounding Liangguang region. 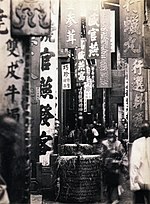 The 19th-century name "Kwang-chow foo" derived from Nanjing dialect of Mandarin and the town's status as a prefectural capital. 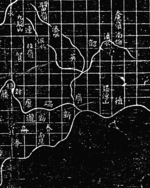 A settlement now known as Nanwucheng was present in the area by 1100 BC. Some traditional Chinese histories placed Nanwucheng's founding during the reign of Ji Yan, king of Zhou from 314–256 BC. It was said to have consisted of little more than a stockade of bamboo and mud. Panyu was established on the east bank of the Pearl River in 214 BC to serve as a base for the Qin Empire's first failed invasion of the Baiyue lands in southern China. Legendary accounts claimed the soldiers at Panyu were so vigilant that they did not remove their armor for three years. Upon the fall of the Qin, General Zhao Tuo established his own kingdom of Nanyue and made Panyu its capital in 204 BC. It remained independent through the Chu-Han Contention, although Zhao negotiated recognition of his independence in exchange for his nominal submission to the Han in 196 BC. Archaeological evidence shows that Panyu was an expansive commercial centre: in addition to items from central China, archaeologists have found remains originating from Southeast Asia, India, and even Africa. Zhao Tuo was succeeded by Zhao Mo and then Zhao Yingqi. Upon Zhao Yingqi's death in 115 BC, his younger son Zhao Xing was named as his successor in violation of Chinese primogeniture. By 113 BC, his Chinese mother, the Empress Dowager Jiu (樛) had prevailed upon him to submit Nanyue as a formal part of the Han Empire. The native prime minister Lü Jia (呂嘉) launched a coup, killing Han ambassadors along with the king, his mother, and their supporters. A successful ambush then annihilated a Han force which had been sent to arrest him. The enraged Emperor Wu launched a massive river- and sea-borne invasion: six armies under Lu Bode and Yang Pu took Panyu and annexed Nanyue by the end of 111 BC. Incorporated into the Han Empire, Panyu became a provincial capital. In AD 226, it became the seat of Guang Prefecture, which gave it its modern name. The Old Book of Tang described Guangzhou as an important port in southern China. Direct routes connected the Middle East and China, as shown in records of a Chinese prisoner returning home from Iraq twelve years after his capture at Talas. Relations were not always peaceful: Muslims sacked the city on 30 October 758[n 1] and were massacred by the Chinese rebel Huang Chao in 878, along with the city's Jews, Christians, and Parsis. Amid the Five Dynasties and Ten Kingdoms that followed the collapse of the Tang dynasty, the Later Liang governor Liu Yan used his base at Panyu to establish a "Great Yue" or "Southern Han" empire, which lasted from 917 to 971. The region enjoyed considerable cultural and economic success in this period. From the 10th to 12th century, there are records that the large foreign communities were not exclusively male, but included "Persian women". [n 2] Guangzhou was visited by the Moroccan traveler Ibn Battuta during his 14th-century journey around the world; he detailed the process by which the Chinese constructed their large ships in the port's shipyards. Shortly after the Hongwu Emperor's declaration of the Ming dynasty, he reversed his earlier support of foreign trade and imposed the first of a series of sea bans (haijin). These banned private foreign trade upon penalty of death for the merchant and exile for his family and neighbors. The Yuan-era maritime intendancies of Guangzhou, Quanzhou, and Ningbo were closed in 1384 and legal trade became limited to the tribute delegations sent to or by official representatives of foreign governments. Following the Portuguese conquest of Malacca, Rafael Perestrello travelled to Guangzhou as a passenger on a native junk in 1516. His report induced Fernão Pires de Andrade to sail to the city with eight ships the next year, but De Andrade's exploration was understood as spying and his brother Simão and others began attempting to monopolize trade, enslaving Chinese women and children,[n 3] engaging in piracy, and fortifying the island of Tamão. Rumors even circulated that Portuguese were eating the children. [n 4] The Guangzhou administration was charged with driving them off: they bested the Portuguese at the Battle of Tunmen and in Xicao Bay; held a diplomatic mission hostage in a failed attempt to pressure the restoration of the sultan of Malacca, who had been accounted a Ming vassal; and, after placing them in cangues and keeping them for most of a year, ultimately executed 23 by lingchi. [n 5] With the help of local pirates, the "Folangji" then carried out smuggling at Macao, Lampacau, and St John's Island (now Shangchuan), until Leonel de Sousa legalized their trade with bribes to Admiral Wang Bo (汪柏) and the 1554 Luso-Chinese Accord. 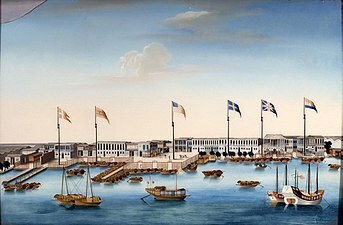 The Portuguese undertook not to raise fortifications and to pay customs dues; three years later, after providing the Chinese with assistance suppressing their former pirate allies, the Portuguese were permitted to warehouse their goods at Macau instead of Guangzhou itself. The Qing became somewhat more open to foreign trade after gaining control of Taiwan in 1683. The Portuguese from Macau and Spaniards from Manila returned, as did private Muslim, Armenian, and English traders. From 1699 to 1714, the French and British East India Companies sent a ship or two each year; the Austrian Ostend General India Co. arrived in 1717, the Dutch East India Co. in 1729, the Danish Asiatic Co. in 1731,[n 7] and the Swedish East India Co. the next year. These were joined by the occasional Prussian or Trieste Company vessel. The first independent American ship arrived in 1784 and the first colonial Australian one in 1788. By that time, Guangzhou was one of the world's great ports, organised under the Canton System. The main exports were tea and porcelain. As a meeting place of merchants from all over the world, Guangzhou became a major contributor to the rise of the modern global economy. In the 19th century, most of the city's buildings were still only one or two storeys. The major structures were the Plain Minaret of the Huaisheng Mosque, the Flower Pagoda of the Temple of the Six Banyan Trees, and the guard tower known as the 5-Storey Pagoda. The northern hills, since urbanized, were bare and covered with traditional graves. The brick city walls were about 6 miles (10 km) in circumference, 25 feet (8 m) high, and 20 feet (6 m) wide. Its eight main gates and two water gates all held guards during the day and were closed at night. The wall rose to incorporate a hill on its northern side and was surrounded on the other three by a moat which, along with the canals, functioned as the city's sewer, emptied daily by the river's tides. 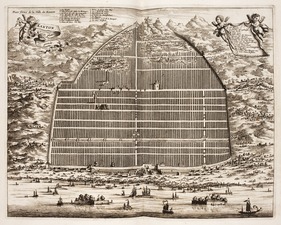 A partition wall with four gates divided the northern "old town" from the southern "new town" closer to the river; the suburb of Xiguan ("West Gate") stretched beyond and the boats of fishers, traders, and Tanka ("boat people") almost entirely concealed the riverbank for about 4 miles (6 km). It was common for homes to have a storefront facing the street and to treat their courtyards as a kind of warehouse. The city was part of a network of signal towers so effective that messages could be relayed to Beijing—about 1,200 miles (1,931 km) away—in less than 24 hours. The Canton System was maintained until the outbreak of the First Opium War in 1839. Following a series of battles in the Pearl River Delta, the British captured Guangzhou itself on 18 March 1841. The Second Battle of Canton was fought two months later. 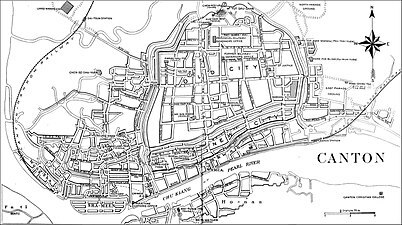 Following the Qing Empire's 1842 treaty with Great Britain, Guangzhou lost its privileged trade status as more and more treaty ports were opened to more and more countries, usually including extraterritorial enclaves. Amid the decline of Qing prestige and the chaos of the Taiping Rebellion, the Punti and Hakka waged a series of clan wars from 1855 to 1867 in which 1 million people died. The concession for the Guangzhou–Hankou railway was awarded to the American China Development Co. in 1898. It completed its branch line west to Foshan and Sanshui before being engulfed in a diplomatic crisis after a Belgian consortium bought a controlling interest and the Qing cancelled its concession. J.P. Morgan was awarded millions in damages and the line to Wuchang wasn't completed until 1936 and a unified Beijing–Guangzhou Railway waited until the completion of Wuhan's Yangtze River Bridge in 1957. During the late Qing Dynasty, Guangzhou was the site of failed revolts such as the Uprisings of 1895 and 1911 to overthrow the Qing; the 72 rebels whose bodies were found after the latter uprising are remembered and honoured as the city's 72 Martyrs in the Huanghuagang ("Yellow Flower Mound") Mausoleum. All these failed revolutionary attempts would eventually lead to the Xinhai Revolution which successfully overthrew the Qing Dynasty to establish a new Han Chinese republic. After the assassination of Song Jiaoren and Yuan Shikai's attempts to remove the Nationalist Party of China from power, the leader of Guangdong Hu Hanmin joined the 1913 Second Revolution against him but was forced to flee to Japan with Sun Yat-sen after its failure. The city came under national spotlight again in 1917, when Prime Minister Duan Qirui's abrogation of the constitution triggered the Constitutional Protection Movement. 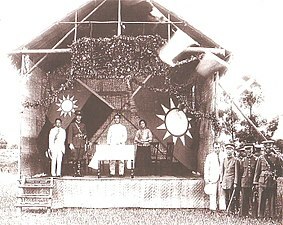 Sun Yat-sen came to head the Guangzhou Military Government supported by the members of the dissolved parliament and the Southwestern warlords. The Guangzhou government fell apart as the warlords withdrew their support. 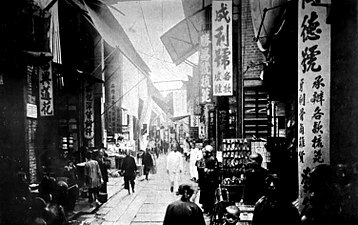 Sun fled to Shanghai in November 1918 until the Guangdong warlord Chen Jiongming restored him in October 1920 during the Yuegui Wars. On 16 June 1922, Sun was ousted in a coup and fled on the warship Yongfeng after Chen sided with the Zhili Clique's Beijing government. In the following months Sun mounted a counterattack into Guangdong by rallying supporters from Yunnan and Guangxi, and in January established a government in the city for the third time. From 1923 to 1926 Sun and the Kuomintang used the city as a base to prosecute a renewed revolution in China by conquering the warlords in the north. Although Sun was previously dependent on opportunistic warlords who hosted him in the city, with the leadership of Chiang Kai-shek, the KMT developed its own military power to serve its ambition. The Canton years saw the evolution of the KMT into a revolutionary movement with a strong military focus and ideological commitment, setting the tone of the KMT rule of China beyond 1927. In 1924 the KMT made the momentous decision to ally with the Communist Party and the USSR. With Soviet help, KMT reorganized itself along the Leninist line and adopted a pro-labor and pro-peasant stance. 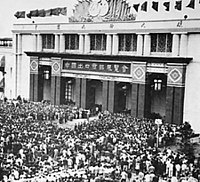 The Kuomintang-CCP cooperation was confirmed in the First Congress of the KMT and the communists were instructed to join the KMT. The allied government set up the Peasant Movement Training Institute in the city, of which Mao Zedong was a director for one term. Sun and his military commander Chiang used Soviet funds and weapons to build an armed force staffed by communist commissars, training its cadres in the Whampoa Military Academy. In August, the fledgling army suppressed the Canton Merchants' Corps Uprising. The next year the anti-imperialist May Thirtieth Movement swept the country, and the KMT government called for strikes in Canton and Hong Kong. The tensions of the massive strikes and protests led to the Shakee Massacre. After the death of Sun Yat-sen in 1925 the mood was changing in the party toward the communists. In August the left-wing KMT leader Liao Zhongkai was assassinated and the right-wing leader Hu Hanmin, the suspected mastermind, was exiled to the Soviet Union, leaving the pro-communist Wang Jingwei in charge. Opposing communist encroachment, the right-wing Western Hills Group vowed to expel the communists from the KMT. 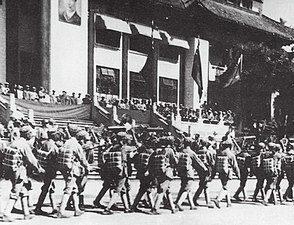 The "Canton Coup" on 20 March 1926 saw Chiang solidify his control over the Nationalists and their army against Wang Jingwei, the party's left wing, its Communist allies, and its Soviet advisors. By May, he had ended civilian control of the military and begun his Northern Expedition against the warlords of the north. Its success led to the split of the KMT between Wuhan and Nanking and the purge of the communists in the Shanghai Massacre. Immediately afterwards Canton joined the purge under the auspice of Li Jishen, resulting in the arrest of communists and the suspension of left wing KMT apparatuses and labor groups. Later in 1927 when Zhang Fakui, a general supportive of the Wuhan faction seized Canton and installed Wang Jingwei's faction in the city, the communists saw an opening and launched the Guangzhou Uprising. Prominent communist military leaders Ye Ting and Ye Jianying led the failed defense of the city. Soon, control of the city reverted to Li Jishen. Li was deposed in the War between Chiang and Guangxi Clique. By 1929, Chen Jitang had established himself as the powerholder of Guangdong. In 1931 he threw his weight behind the anti-Chiang schism by hosting a separate Nationalist government in Guangzhou. Opposing Chiang's alleged dictatorship, the separatists included KMT leaders like Wang Jingwei, Sun Fo and others from diverse factions. The peace negotiations amidst the armed stand-off led to the 4th National Congress of Kuomintang being held separately by three factions in Nanjing, Shanghai and Canton. Resigning all his posts, Chiang pulled off a political compromise that reunited all factions. While the intraparty division was resolved, Chen kept his power until he was defeated by Chiang in 1936. During World War II, the "Canton Operation" subjected the city to Japanese occupation by the end of December 1938. Amid the closing months of the Chinese Civil War, Guangzhou briefly served as the capital of the Republic of China after the taking of Nanjing by the PLA in April 1949. The People's Liberation Army entered the city on 14 October 1949. Amid a massive exodus to Hong Kong and Macau, the Nationalists blew up the Haizhu Bridge across the Pearl River in retreat. The Cultural Revolution had a large effect on the city with much of its temples, churches and other monuments destroyed during this chaotic period. 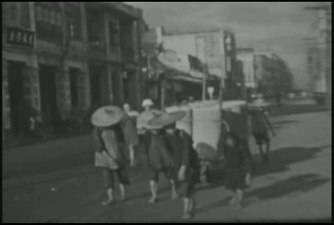 The People's Republic of China initiated building projects including new housing on the banks of the Pearl River to adjust the city's boat people to life on land. Since the 1980s, the city's close proximity to Hong Kong and Shenzhen and its ties to overseas Chinese have made it one of the first beneficiaries of China's opening up under Deng Xiaoping. Beneficial tax reforms in the 1990s have also helped the city's industrialisation and development. The municipality was expanded in the year 2000, with Huadu and Panyu joining the city as urban districts and Conghua and Zengcheng as more rural counties. 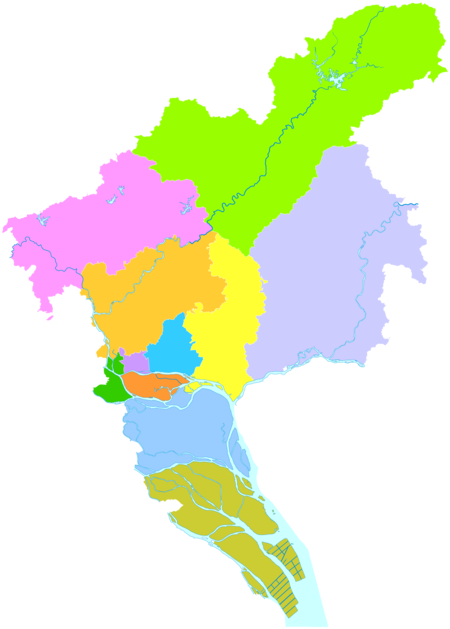 The former districts of Dongshan and Fangcun were abolished in 2005, merged into Yuexiu and Liwan respectively. The city acquired Nansha and Luogang. The former was carved out of Panyu, the latter from parts of Baiyun, Tianhe, Zengcheng, and an exclave within Huangpu. The National People's Congress approved a development plan for the Pearl River Delta in January 2009; on March 19 the same year, the Guangzhou and Foshan municipal governments agreed to establish a framework to merge the two cities. In 2014, Luogang merged into Huangpu and both Conghua and Zengcheng counties were upgraded to districts. Guangzhou was then the most populous consolidated district-governed city in China until Beijing overtook it the next year. 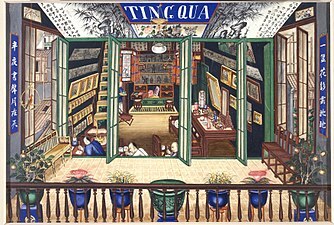 An 1855 painting of the gallery of Tingqua, one of the most successful suppliers of "export paintings" for Guangzhou's foreign traders. The US Navy's Dept of Navigation's 1920 map of "Canton"
The Guangzhou Bund in 1930, with rows of Tanka boats. The elevation of the prefecture generally increases from southwest to northeast, with mountains forming the backbone of the city and the ocean comprising the front. Tiantang Peak (天堂顶, "Heavenly Peak") is the highest point of elevation at 1,210 metres (3,970 ft) above sea level. There are 47 different types of minerals and also 820 ore fields in Guangzhou, including 18 large and medium-sized oil deposits. The major minerals are granite, cement limestone, ceramic clay, potassium, albite, salt mine, mirabilite, nepheline, syenite, fluorite, marble, mineral water, and geothermal mineral water. Since Guangzhou is located in the water-rich area of southern China, it has a wide water area with lots of rivers and water systems, accounting for 10% of the total land area. The rivers and streams improve the landscape and keep the ecological environment of the city stable. Despite being located just south of the Tropic of Cancer, Guangzhou has a humid subtropical climate (Köppen Cfa) influenced by the East Asian monsoon. Summers are wet with high temperatures, high humidity, and a high heat index. Winters are mild and comparatively dry. Guangzhou has a lengthy monsoon season, spanning from April through September. Monthly averages range from 13.9 °C (57.0 °F) in January to 28.9 °C (84.0 °F) in July, while the annual mean is 22.6 °C (72.7 °F). Autumn, from October to December, is very moderate, cool and windy, and is the best travel time. The relative humidity is approximately 68 percent, whereas annual rainfall in the metropolitan area is over 1,700 mm (67 in). 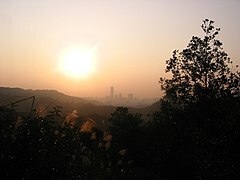 With monthly percent possible sunshine ranging from 17 percent in March and April to 52 percent in November, the city receives 1,628 hours of bright sunshine annually, considerably less than nearby Shenzhen and Hong Kong. Extreme temperatures have ranged from 0 °C (32 °F) to 39.1 °C (102.4 °F). The last recorded snowfall in the city was on 24 January 2016, 87 years after the second last recorded snowfall. Guangzhou is the main manufacturing hub of the Pearl River Delta, one of mainland China's leading commercial and manufacturing regions. In 2017, the GDP reached ¥2,150 billion (US$318 billion), per capita was ¥150,678 (US $22,317). Guangzhou is considered one of the most prosperous cities in China. Owing to rapid industrialisation, it is also considered one of the most polluted cities once. But as city development goes greener, it is now one of the most livable cities in China. The Canton Fair, formally the "China Import and Export Fair", is held every year in April and October by the Ministry of Trade. Inaugurated in the spring of 1957, the fair is a major event for the city. It is the trade fair with the longest history, highest level, largest scale in China. From the 104th session onwards, the fair moved to the new Guangzhou International Convention and Exhibition Center (广州国际会展中心) in Pazhou, from the older complex in Liuhua. The GICEC is served by two stations on Line 8 and three stations on Tram Line THZ1. Since the 104th session, the Canton Fair has been arranged in three phases instead of two phases. Cantonese sculpture includes work in jade, wood, and (now controversially) ivory. Canton porcelain developed over the past three centuries as one of the major forms of exportware. It is now known within China for its highly colorful style. Cantonese embroidery is one of China's four main styles of the art and is represented in Guangzhou, although its principal centre is at Chaozhou. Zhujiang Beer, a pale lager, is one of China's most successful brands. It is made in Guangzhou from water piped directly to the brewery from a natural spring. Guangzhou Peugeot Automobile Company produced the Peugeot 504 and Peugeot 505 automobiles from 1989 to 1997. The Export Processing Zone was founded in 2005. Its total planned area is 1.36 km2 (0.53 sq mi). It is located in Nansha District and it belongs to the provincial capital, Guangzhou. The major industries encouraged in the zone include automobile assembly, biotechnology and heavy industry. It is situated 54 kilometres (34 miles) (70 minutes drive) south of Guangzhou Baiyun International Airport and close to Nansha Port. It also has the advantage of Guangzhou Metro line 4 which is being extended to Nansha Ferry Terminal. The zone was founded in 1992. It is located in the east of Huangpu District and near to Guangzhou Economic and Technological Development Zone. It is also very close to Guangzhou Baiyun Airport. The major industries encouraged in the zone include international trade, logistics, processing and computer software. The 2010 census found Guangzhou's population to be 12.78 million. As of 2014[update], it was estimated at 13,080,500, with 11,264,800 urban residents. Its population density is thus around 1,800 people per km2. The built-up area of the Guangzhou proper connects directly to several other cities. The built-up area of the Pearl River Delta Economic Zone covers around 17,573 square kilometres (6,785 sq mi) and has been estimated to house 22 million people, including Guangzhou's nine urban districts, Shenzhen (5.36m), Dongguan (3.22m), Zhongshan (3.12m), most of Foshan (2.2m), Jiangmen (1.82m), Zhuhai (890k), and Huizhou's Huiyang District (760k). The total population of this agglomeration is over 28 million after including the population of the adjacent Hong Kong Special Administrative Region. The area's fast-growing economy and high demand for labour has produced a huge "floating population" of migrant workers. Up to 10 million migrants reside in the area least six months each year. In 2008, about 5 million of Guangzhou's permanent residents were hukouless migrants. Most of Guangzhou's population is Han Chinese. Almost all of the local Cantonese people speak Cantonese as their first language, while most migrants speak forms of Mandarin. In 2010, each language was the native tongue of roughly half of the city's population, although minor but substantial numbers speak other varieties as well. In 2018, He Huifeng of the South China Morning Post stated that younger residents have increasingly favored using Mandarin instead of Cantonese in their daily lives, causing their Cantonese-speaking grandparents and parents to use Mandarin to communicate with them. He Huifeng stated that factors included local authorities discouraging the use of Cantonese in schools and the rise in prestige of Mandarin-speaking Shenzhen. s.Guangzhou has a very unbalanced gender ratio, but its province has a higher imbalance than the rest of the country. While most areas of China have 112-120 boys per 100 girls, the Guangdong province that houses Guangzhou has more than 130 boys for every 100 girls. The influx of Chinese immigrants in Guangzhou also brought a estimated 300,000 prostitutes mostly from Sichuan from central China. Guangzhou now has a huge influx of migrants, with up to 30 million additional migrants living in the area for at least 6 months out of every year. This huge influx of people from other areas, called the floating population, is due to the city's fast-growing economy and high labor demands. Guangzhou Mayor Wan Qingliang told an urban planning seminar that Guangzhou is facing a very serious population problem stating that, while the city had 10.33 million registered residents at the time with targets and scales of land use based on this number, the city actually had a population with migrants of nearly 15 million.. According to the Guangzhou Academy of Social Sciences researcher Peng Peng, the city is almost at its maximum capacity of just 15 million, which means the city is facing a great strain, mostly due to a high population of unregistered people. According to the 2000 National Census, marriage is one of the top 2 reasons for permanent migration and particular important for female as 29.3 % of the permanent female migrants migrate for marriage [Liang et al.,2004]. Many of the economic migrant female marries men from Guangzhou in hopes of a better life. but like elsewhere in the People's Republic of China, the household registration system (hukou) limits migrants' access to residences, educational institutions and other public benefits. In May 2014, legally employed migrants in Guangzhou were permitted to receive a hukou card allowing them to marry and obtain permission for their pregnancies in the city, rather than having to return to their official hometowns as previously. Historically, the Cantonese people have made up a sizeable part of the 19th- and 20th-century Chinese diaspora and many overseas Chinese have ties to Guangzhou. This is particularly true in the United States, Canada, and Australia. Demographically, the only significant immigration into China has been by overseas Chinese, but Guangzhou sees many foreign tourists, workers, and residents from the usual locations such as the United States. Notably, it is also home to thousands of African immigrants, including people from Nigeria, Angola and the Democratic Republic of Congo. The encompassing metropolitan area was estimated by the OECD (Organisation for Economic Co-operation and Development) to have, as of 2010[update], a population of 25 million. When the first line of the Guangzhou Metro opened in 1997, Guangzhou was the fourth city in Mainland China to have an underground railway system, behind Beijing, Tianjin, and Shanghai. Currently the metro network is made up of thirteen lines, covering a total length of 476.26 km (295.93 mi). A long-term plan is to make the city's metro system expand to over 500 km (310 mi) by 2020 with 15 lines in operation. In addition to the metro system there is also the Haizhu Tram line which opened on 31 December 2014. 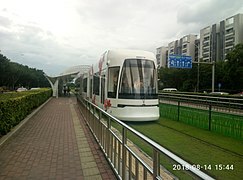 The Guangzhou Bus Rapid Transit (GBRT) system which was introduced in 2010 along Zhongshan Road. It has several connections to the metro and is the world's 2nd-largest Bus Rapid Transit system with 1,000,000 passenger trips daily. It handles 26,900 pphpd during the peak hour a capacity second only to the TransMilenio BRT system in Bogota. The system averages 1 bus every 10 seconds or 350 per hour in a single direction and contains the world's longest BRT stations—around 260 m (850 ft) including bridges. In the 19th century, city already boasted over 600 long, straight streets; these were mostly paved but still very narrow. In June 1919, work began on demolishing the city wall to make way for wider streets and the development of tramways. The demolition took three years in total. In 2009, it was reported that all 9,424 buses and 17,695 taxis in Guangzhou would be operating on LPG-fuel by 2010 to promote clean energy for transport and improve the environment ahead of the 2010 Asian Games which were held in the city. At present[when? ], Guangzhou is the city that uses the most LPG-fueled vehicles in the world, and at the end of 2006, 6,500 buses and 16,000 taxis were using LPG, taking up 85 percent of all buses and taxis. Effective January 1, 2007, the municipal government banned motorcycles in Guangdong's urban areas. Motorcycles found violating the ban are confiscated. The Guangzhou traffic bureau claimed to have reported reduced traffic problems and accidents in the downtown area since the ban. Guangzhou's main airport is the Baiyun International Airport in Baiyun District; it opened on August 5, 2004. This airport is the second busiest airport in terms of traffic movements in China. It replaced the old Baiyun International Airport, which was very close to the city centre but failed to meet the city's fast-growing air traffic demand. The old Baiyun International Airport was in operation for 72 years. Guangzhou Baiyun International Airport now has three runways, with two more planned. The Terminal 2 has opened on April 26, 2018. Another airport located in Zengcheng District is under planning. Guangzhou is served by Hong Kong International Airport; ticketed passengers can take ferries from the Lianhuashan Ferry Terminal and Nansha Ferry Port in Nansha District to the HKIA Skypier. There are also coach bus services connecting Guangzhou with HKIA. 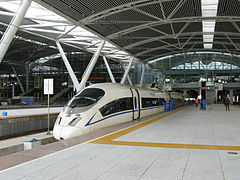 Guangzhou is the terminus of the Beijing–Guangzhou, Guangzhou–Shenzhen, Guangzhou–Maoming and Guangzhou–Meizhou–Shantou conventional speed railways. In late 2009, the Wuhan–Guangzhou high-speed railway started service, with multiple unit trains covering 980 km (608.94 mi) at a top speed of 320 km/h (199 mph). In December 2014, the Guiyang–Guangzhou high-speed railway and Nanning-Guangzhou railway began service with trains running at top speeds of 250 km/h (155 mph) and 200 km/h (124 mph), respectively. The Guangdong Through Train departs from the Guangzhou East railway station and arrives at the Hung Hom KCR station in Kowloon, Hong Kong. The route is approximately 182 km (113 mi) in length and the ride takes less than two hours. Frequent coach services are also provided with coaches departing every day from different locations (mostly major hotels) around the city. A number of regional railways radiating from Guangzhou started operating such as the Guangzhou–Zhuhai intercity railway and the Guangzhou-Foshan-Zhaoqing intercity railway. There are daily high-speed catamaran services between Nansha Ferry Terminal and Lianhua Shan Ferry Terminal in Guangzhou and the Hong Kong China Ferry Terminal, as well as between Nansha Ferry Terminal and Macau Ferry Pier in Hong Kong. Guangzhou Opera House & Symphony Orchestra also perform classical Western music and Chinese compositions in their style. Cantonese music is a traditional style of Chinese instrumental music, while Cantopop is the local form of pop music and rock-and-roll which developed from neighbouring Hong Kong. Taoism and Chinese folk religion are still represented at a few of the city's temples. Among the most important is the Temple of the Five Immortals, honoring the five immortals credited with introducing rice cultivation at the foundation of the city. The five rams they rode were supposed to have turned into stones upon their departure and gave the city several of its nicknames. Another place of worship is the City God Temple. Guangzhou, like most of southern China, is also notably observant concerning ancestral veneration during occasions like the Tomb Sweeping and Ghost Festivals. Buddhism is the most prominent religion in Guangzhou. 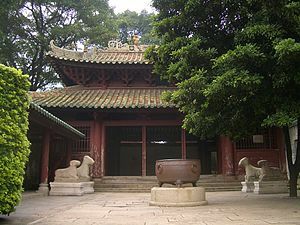 The Zhizhi Temple was founded in AD 233 from the estate of a Wu official; it is said to comprise the residence of Zhao Jiande, the last of the Nanyue kings, and has been known as the Guangxiao Temple ("Temple of Bright Filial Piety") since the Ming. The missionary Bodhidharma is traditionally said to have visited Panyu during the Liu Song or Liang dynasties (5th or 6th century). 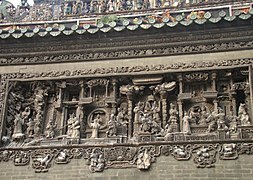 Around AD 520, Emperor Wu of the Liang ordered the construction of the Baozhuangyan Temple and the Xilai Monastery to store the relics of Cambodian Buddhist saints which had been brought to the city and to house the monks beginning to assemble there. 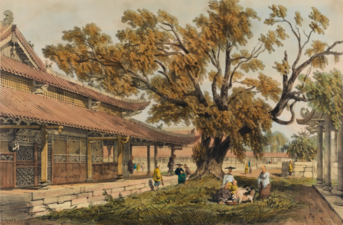 The Baozhuangyan is now known as the Temple of the Six Banyan Trees, after a famous poem composed by Su Shi after a visit during the Northern Song. The Xilai Monastery was renamed the Hualin Temple ("Flowery Forest Temple") after its reconstruction during the Qing. The temples were damaged by both the Republican campaign to "Promote Education with Temple Property" (廟產興學) and the Maoist Cultural Revolution but have been renovated since the opening up that began in the 1980s. 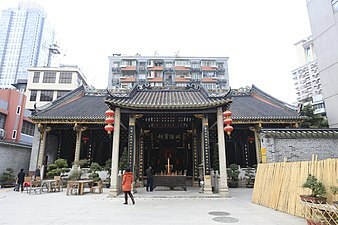 The Ocean Banner Temple on Henan Island, once famous in the west as the only tourist spot in Guangzhou accessible to foreigners, has been reopened as the Hoi Tong Monastery. Nestorian Christians first arrived in China via the overland Silk Road, but suffered during Emperor Wuzong's 845 persecution and were essentially extinct by the year 1000. The Qing-era ban on foreigners limited missionaries until it was abolished following the First Opium War, although the Protestant Robert Morrison was able to perform some work through his service with the British factory. 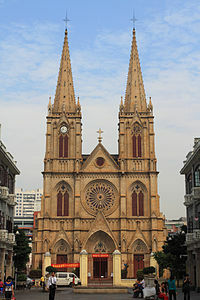 The Catholic Archdiocese of Guangzhou is housed at Guangzhou's Sacred Heart Cathedral, known locally as the "Stone House". A Gothic Revival edifice which was built by hand from 1861 to 1888 under French direction, its original Latin and French stained-glass windows were destroyed during the wars and amid the Cultural Revolution; they have since been replaced by English ones. 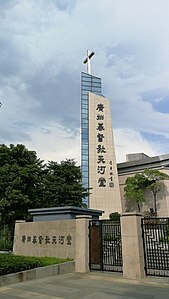 The Canton Christian College (1888) and Hackett Medical College for Women (1902) were both founded by missionaries and now form part of Guangzhou's Lingnan. Since the opening up of China in the 1980s, there has been renewed interest in Christianity, but Guangzhou maintains pressure on underground churches which avoid registration with government officials. The Catholic archbishop Dominic Tang was imprisoned without trial for 22 years, but his present successor is recognised by both the Vatican and China's Patriotic Church. Guangzhou has had a Muslim community since very early in the history of Islam; the native or nativised adherents of the faith are known as the Hui. Huaisheng Mosque was probably built during the Tang dynasty. Muslims sacked the city in 758 and were massacred by the Chinese rebel Huang Chao in 878, along with the Jews, Christians, and Parsis. The modern city includes numerous halal restaurants. The 18,000 seat Guangzhou International Sports Arena will be one of the venues for the 2019 FIBA Basketball World Cup. 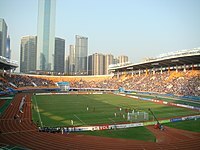 From 12–27 November 2010, Guangzhou hosted the 16th Asian Games. The same year, it hosted the first Asian Para Games from December 12 to 19. Combined, these were the largest sporting events the city ever hosted. In the early 2010s, Guangzhou Evergrande Taobao F.C. has risen to be a powerhouse in association football in China, having won seven consecutive national titles between 2011 and 2017. The team has also won the AFC Champions League in 2013 and 2015. The club has competed at the 2013 and 2015 FIFA Club World Cup, where it lost 3–0 in the semi-final stage to the 2012–13 UEFA Champions League winners FC Bayern Munich and the 2014–15 UEFA Champions League winners FC Barcelona, respectively. "Towers Shining through the New Town"
"Science City, Splendid as Brocade"
In every district there are many shopping areas where people can walk on the sidewalks; however most of them are not set as pedestrian streets. There are many malls and shopping centers in Guangzhou. The majority of the new malls are located in the Tianhe district. Guangzhou has two local radio stations: the provincial Radio Guangdong and the municipal Radio Guangzhou. Together they broadcast in more than a dozen channels. The primary language of both stations is Cantonese. Traditionally only one channel of Radio Guangdong is dedicated to Mandarin Chinese. However, in recent years there has been an increase in Mandarin programmes on most Cantonese channels. 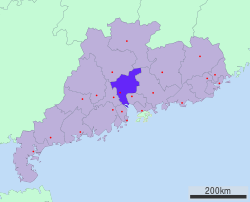 Radio stations from cities around Guangzhou mainly broadcast in Cantonese and can be received in different parts of the city, depending on the radio stations' locations and transmission power. The Beijing-based China National Radio also broadcasts Mandarin programmes in the city. Radio Guangdong has a 30-minute weekly English programme, Guangdong Today, which is broadcast globally through the World Radio Network. Daily English news programmes are also broadcast by Radio Guangdong. Guangzhou has some of the best Chinese-language newspapers and magazines in mainland China, most of which are published by three major newspaper groups in the city, the Guangzhou Daily Press Group, Nanfang Press Corporation, and the Yangcheng Evening News Group. The two leading newspapers of the city are Guangzhou Daily and Southern Metropolis Daily. The former, with a circulation of 1.8 million, has been China's most successful newspaper for 14 years in terms of advertising revenue, while Southern Metropolis Daily is considered one of the most liberal newspapers in mainland China. In addition to Guangzhou's Chinese-language publications, there are a few English magazines and newspapers. The most successful is That's Guangzhou, which started more than a decade ago and has since blossomed into That's PRD, producing expatriate magazines in Beijing and Shanghai as well. It also produces In the Red. The Guangzhou Higher Education Mega Centre, also known as Guangzhou University Town (广州大学城), is a large tertiary education complex located in the southeast suburbs of Guangzhou. It occupies the entirety of Xiaoguwei Island in Panyu District, covering an area of about 18 square kilometres (7 sq mi). The complex accommodates campuses from ten higher education institutions and can eventually accommodate up to 200,000 students, 20,000 teachers, and 50,000 staff. The two main comprehensive libraries are Guangzhou Library and Sun Yat-sen Library of Guangdong Province. Guangzhou Library is a public library in Guangzhou. The library has moved to a new building in Zhujiang New Town, which fully opened on 23 June 2013. Sun Yat-sen Library of Guangdong Province has the largest collection of ancient books in Southern China. Guangzhou currently maintains sister city agreements with the following foreign cities. ^ Given in contemporary sources as the "Guisi Day" (癸巳) of the 9th lunar month of the first year of the Qianyuan Era under Emperor Suzong of the Tang. ^ The term "Persian" may, however, have been loosely applied and referred indifferently to any similar-looking foreign women. ^ "Buying and selling of children was scarcely unknown in Ming China, but the large new demands of the Portuguese may have stimulated kidnappings from good families..."
^ "Some early Chinese historians go even so far as to give vivid details of the price paid for the children and how they were roasted." ^ "On the day of St Nicholas [6 Dec.] in the year 1522 they put boards on them with the sentence that they should die and be exposed in pillories as robbers. The sentences said: 'Petty sea robbers sent by the great robber falsely; they come to spy out our country; let them die in pillories as robbers.' A report was sent to the king according to the information of the mandarins, and the king confirmed the sentence. On 23 Sept. 1523 these twenty-three persons were each one cut in pieces, to wit, heads, legs, arms, and their private members placed in their mouths, the trunk of the body being divided into two pieces round the belly. In the streets of Canton, outside the walls, in the suburbs, through the principal streets they were put to death, at distances of one crossbow shot from one another, that all might see them, both those of Canton and those of the environs, in order to give them to understand that they thought nothing of the Portuguese, so that the people might not talk of the Portuguese. Thus... they were all killed, and their heads and private members were carried on the backs of the Portuguese in front of the mandarins of Canton with the playing of musical instruments and rejoicing, were exhibited suspended in the streets, and were then thrown into the dunghills. And from henceforth it was resolved not to allow any more Portuguese into the country nor other strangers." ^ The Shaowu Emperor's remains are buried in Yuexiu Park. ^ In fact, the Danish Asiatic Company was formally chartered in April 1732 while this first ship, the Cron-Printz Christian, was on its return trip. Counting the Cron-Printz Christian, up to 1833, the DAC dispatched 130 ships to Guangzhou, losing five. The average voyage from Copenhagen took 216 days and the voyage back, 192. ^ The statement is an excerpt from the longer proverb "Be born in Suzhou, play in Hangzhou, eat in Guangzhou, and die in Liuzhou" (生在苏州，玩在杭州，食在广州，死在柳州). ^ The other seven are the cuisines of Anhui, Fujian, Hunan, Jiangsu, Shandong, Sichuan and Zhejiang. ^ 土地面积、人口密度（2008年）. Statistics Bureau of Guangzhou. Archived from the original on 2015-03-23. Retrieved 2010-02-08. ^ a b 统计年鉴2014 [Statistical Yearbook 2014] (in Chinese). Statistics Bureau of Guangzhou. 7 April 2015. Archived from the original on 14 December 2009. Retrieved 1 May 2015. ^ 深圳GDP超广州，不过广州也不用慌 [The 2016 Guangzhou Municipal National Economic and Social Development Statistics Bulletin] (in Chinese). Baijiahao.baidu.com. Jan 15, 2018. Archived from the original on 2018-02-05. Retrieved 2017-11-11. ^ "Guangzhou (China) Archived 2010-10-08 at the Wayback Machine". Encyclopædia Britannica. Accessed September 12, 2010. ^ "Illuminating China's Provinces, Municipalities and Autonomous Regions". PRC Central Government Official Website. Archived from the original on 2014-06-19. Retrieved 2014-05-17. ^ 海上丝绸之路的三大著名港口. People.cn. Archived from the original on 2016-06-03. Retrieved 2014-05-20. ^ a b c d "Tourism Administration of Guangzhou Municipality". visitgz.com. Archived from the original on September 6, 2010. Retrieved 2010-03-21. ^ 中央机构编制委员会印发《关于副省级市若干问题的意见》的通知. 中编发5号. docin.com. February 19, 1995. Archived from the original on May 29, 2014. Retrieved 2014-05-28. ^ 全国乡镇规划确定五大中心城市. Southern Metropolitan Daily. February 9, 2010. Archived from the original on July 31, 2013. Retrieved 2010-07-29. .
^ "The World According to GaWC 2016". 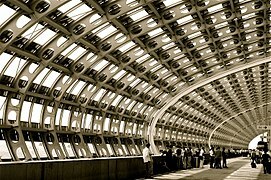 Globalization and World Cities Research Network. 2017-03-31. Archived from the original on 2013-10-10. Retrieved 2017-04-17. ^ Huang Junjie (黄俊杰) (11 June 2008). 广州一不小心成了"第三世界"首都？. 新周刊 (277). Archived from the original on 2016-10-21. Retrieved 29 January 2016. .
^ Cheng, Andrew; Geng, Xiao (6 April 2017). "Unlocking the potential of Chinese cities". China Daily. Archived from the original on 2017-09-28. Retrieved 28 September 2017. ^ Mensah Obeng, Mark Kwaku (2018). "Journey to the East: a study of Ghanaian migrants in Guangzhou, China". Canadian Journal of African Studies: 1–21. doi:10.1080/00083968.2018.1536557. 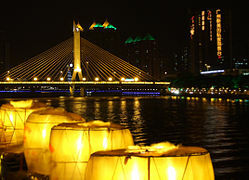 ^ "Guangzhou tops best mainland commercial cities rankings". chinadaily. December 16, 2014. Archived from the original on August 24, 2016. Retrieved 2016-02-01. .
^ Versteegh, Kees; Mushira Eid (2005), Encyclopedia of Arabic Language and Linguistics, Vol. I, Leiden: Brill, pp. 378 ff, ISBN 978-90-04-14473-6, retrieved 11 February 2016 . ^ Ng Wing Chung (2015). The Rise of Cantonese Opera. University of Illinois Press. p. 31. ISBN 9780252097096. ^ Chin, Angelina (2012). Bound to Emancipate: Working Women and Urban Citizenship in Early Twentieth-Century China and Hong Kong. Rowman & Littlefield. p. 202. ISBN 9781442215610. ^ The Chinese Repository. Vol. II (2nd ed.). Kraus Reprint Ltd. 1834. p. 148. ^ The lexicographer only accepted Canton as a proper noun referring to the city, and considered usages with reference to the province as an “ellipsis”, see Yule & al. ^ Hamilton, Alexander (1744), Kate Teltscher (ed. ), A New Account of the East Indies: Giving an Exact and Copious Description of the Situation, reprinted by Oxford University Press, 2013, ""
^ a b c d e f g EB (1878), p. 37. ^ a b Gray (1875), p. 1–2. ^ a b ACC (1845), p. 82. ^ a b Yü (1987), p. 453. ^ Morton, W. Scott; Lewis, Charlton M. (2004), China: Its History and Culture, 4th ed., New York: McGraw-Hill, p. 56, ISBN 978-0-07-141279-7 . ^ a b Sima Guang. Zizhi Tongjian [Comprehensive Mirror to Aid in Government]. .
^ Memoirs of the Research Department of the Toyo Bunko (Oriental Library), No. 2. Ann Arbor: Toyo Bunko. 1928. p. 34. .
^ Lombard-Salmon, Claudine (2004). "Les Persans à l'Extrémité Orientale de la Route Maritime (IIe A.E. -XVIIe Siècle)". Archipel. Archipel. Vol. 68: 40. doi:10.3406/arch.2004.3830. .
^ Isis, Vol. 30. University of Pennsylvania. 1939. p. 120. .
^ Dunn (2005), p. 259. ^ Von Glahn (1996), p. 90. ^ Li (2010), p. 3. ^ Von Glahn (1996), p. 116. ^ Von Glahn (1996), p. 91. ^ a b Knight's (1841), p. 135. ^ Cortesao (1944), p. xxxiv. ^ Wills (1998), p. 331. ^ Wills (1998), pp. 331–2. ^ a b Douglas (2006), p. 11. ^ a b Wills & al. (2010), p. 28. ^ a b Dutra & al. (1995), p. 426. ^ Wills (1998), pp. 337–8. ^ Cortesao (1944), p. xxxvii. ^ Cortesao (1944), p. xxxix. ^ Wills (1998), p. 339. ^ Cortesao (1944), p. xl, xliii. ^ Wills (1998), p. 340. ^ a b Cortesao (1944), p. xliv–v. ^ Willis (1998), p. 343. ^ Wills (1998), p. 343–344. ^ Wakeman (1985), p. 737. ^ Wakeman (1985), p. 738. ^ a b c d e Gunn, p. 208. ^ Butel (1997), p. 197. ^ Kjellberg (1975), p. 99. ^ Kjellberg (1975), p. 95. ^ Bulletins &c. (1841), p. 357. ^ MacPherson (1843), pp. 312 & 315. ^ a b Beck (2007). ^ "Guangzhou and Foshan signed "City Merge Cooperation Framework"". News.xinhuanet.com. Archived from the original on 2009-07-05. Retrieved 2010-05-06. ^ US Navy Ports of the World: Canton, Ditty Box Guide Book Series, US Bureau of Navigation, "Canton"
^ "The longest & largest rivers in China, Major rivers in China". www.topchinatravel.com. Retrieved 2019-01-28. ^ "Baiyun Mountain Scenic Area". Baiyunshan.com.cn. Archived from the original on 8 October 2013. Retrieved 11 September 2013. ^ "Guangzhou International". english.gz.gov.cn. Archived from the original on 2016-11-09. Retrieved 2016-11-08. ^ "Travel China Guide: Fascinating Guangzhou". Blogspot. 12 August 2008. Archived from the original on 8 July 2011. Retrieved 21 August 2008. ^ a b "Extreme Temperatures Around the World". Retrieved 2010-12-01. ^ 广州全城多处降雪 广州塔顶现厚厚积雪. southcn.com. 24 January 2016. Archived from the original on 25 January 2016. Retrieved 24 January 2016. ^ 中国地面国际交换站气候标准值月值数据集（1971－2000年) (in Chinese). China Meteorological Administration. Archived from the original on 2013-09-21. Retrieved August 12, 2016. ^ 广东统计年鉴2010. Gdstats.gov.cn. Archived from the original on June 11, 2011. Retrieved 2011-06-02. ^ "Canton Fair Online". 19 January 2016. Archived from the original on 23 January 2016. Retrieved 19 January 2016. ^ "Guangzhou Nansha Export Processing Zone". RightSite.asia. Archived from the original on 2009-11-19. Retrieved 2010-05-06. ^ "Guangzhou Free Trade Zone". RightSite.asia. Archived from the original on 2009-11-13. Retrieved 2010-05-06. ^ a b c d e f g 广州50年统计年鉴. gzstats.gov.cn. Archived from the original on 2009-12-14. ^ 广州市商业网点发展规划主报告（2003–2012）（下篇） (PDF) (in Chinese). Department of Market System Development, Ministry of Commerce of the People's Republic of China. Archived (PDF) from the original on 2005-11-04. Retrieved 2011-08-04. ^ a b c d e 统计年鉴2012 [Statistical Yearbook 2012] (in Chinese). Statistics Bureau of Guangzhou. September 2012. Archived from the original on 2009-12-14. Retrieved 2013-07-09. ^ a b c d e "MAJOR SOCIAL AND ECONOMIC INDICATORS IN MAIN YEARS". Guangzhou Statistical Yearbook 2012–2015. Statistics Bureau of Guangzhou. Archived from the original on 2016-05-21. Retrieved 2015-05-01. ^ a b Branigan, Tania (25 July 2010). "Protesters gather in Guangzhou to protect Cantonese language". The Guardian. London. Archived from the original on 15 September 2013. ^ The People's Daily, cited by The Guardian. ^ He, Huifeng (2018-03-12). "Why has Cantonese fallen out of favour with Guangzhou youngsters?". South China Morning Post. Retrieved 2018-07-07. ^ Tatlow, Didi Kirsten (July 9, 2014). "Go South to Guangzhou, a 'Home' Away From Home". New York Times. New York, New York. Archived from the original on July 14, 2014. Retrieved 2014-07-10. ^ Lai, H. Mark (2004). Becoming Chinese American: A History of Communities and Institutions. AltaMira Press. ISBN 978-0-7591-0458-7. ^ "2006 Census Profile of Federal Electoral Districts (2003 Representation Order): Language, Mobility and Migration and Immigration and Citizenship". Ottawa: Statistics Canada. 2007. ^ "About Guangzhou Metro". Guangzhou Metro. 2015-12-30. Archived from the original on 2017-12-29. Retrieved 2016-01-26. ^ "Guangzhou's Remarkable Bus Rapid Transit System". Reuters. April 5, 2011. Archived from the original on May 31, 2013. Retrieved 2011-04-15. ^ "Case Study of the Guangzhou BRT". International Public Transport Conference 2010. Archived from the original on July 13, 2011. Retrieved 2010-08-05. ^ Lee, Edward Bing-Shuey (1936). Modern Canton. Shanghai: The Mercury Press. ^ "Guangzhou expects to run all buses and taxis on LPG for Asiad". Official website of the Chinese Olympic Committee. July 17, 2009. Archived from the original on August 27, 2012. Retrieved 2013-03-20. ^ "Guangzhou Bans Motorcycles". Life of Guangzhou. January 3, 2007. Archived from the original on December 6, 2008. Retrieved 2008-08-28. ^ "Traffic Jam Improve after Motorcycle Ban". Life of Guangzhou. January 19, 2007. Archived from the original on December 6, 2008. Retrieved 2008-08-28. ^ 广州新白云机场正式运营(图). Sina News. 2004-08-06. Archived from the original on 2014-05-02. Retrieved 2014-05-02. ^ 确认过眼神，一图带你打开白云机场T2航站楼大门. xinhuanet.com. April 26, 2018. Archived from the original on 2018-09-02. Retrieved 2018-09-02. 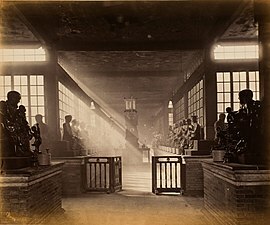 ^ 广州第二机场选址获突破性进展. news.ifeng.com. November 20, 2017. Archived from the original on 2018-09-02. Retrieved 2018-09-02. ^ Chen Qingjie (陈清浩) (2014-12-26). 贵广高铁正式开通运营 从贵阳到广州4小时可达 (in Chinese). Southern Post (南方日报). Archived from the original on 2016-03-04. ^ "Eight Cuisines of China – Shandong & Guangdong". TravelChinaGuide.com. Archived from the original on 2011-08-28. ^ "Fujian Cuisine. Beautyfujian.com Archived 2011-07-10 at the Wayback Machine. Accessed June 2011. ^ "Viii. Appendix Ii". China.hrw.org. December 28, 1997. Archived from the original on October 3, 2011. Retrieved 28 August 2011. 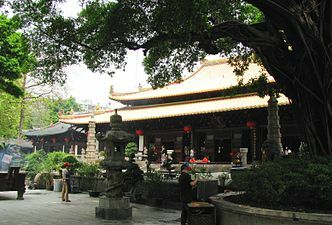 ^ "Six Banyan Trees Temple – Famous Buddhist temple of Guangzhou". Excelguangzhou.com. Archived from the original on 2011-07-29. Retrieved 2011-08-28. ^ Keung. Ching Feng. p. 235. ^ "CHINA Beijing and Guangzhou attack underground Churches – Asia News". Asianews.it. Archived from the original on 2011-06-12. Retrieved 2011-08-28. ^ Lipman, Jonathan Neaman (1997). Familiar strangers: a history of Muslims in Northwest China. University of Washington Press. p. 29. ISBN 978-962-209-468-0. ^ "Charaktereigenschaften der Guangzhouer – Guangzhou – Deutschabteilung Der SYSU". Fls.sysu.edu.cn. 9 October 2007. Archived from the original on 18 January 2012. Retrieved 28 August 2011. ^ The Official website of the 2019 FIBA Basketball World Cup Archived 2017-05-27 at the Wayback Machine, FIBA.com, Retrieved 9 March 2016. ^ "Guangzhou wins Asiad bid". News Guangdong. July 2, 2004. Archived from the original on November 27, 2010. Retrieved June 30, 2010. ^ "Bayern Munich's Franck Ribéry leads rout of Guangzhou Evergrande". The Guardian. December 18, 2013. Archived from the original on December 18, 2013. ^ "GZ's New Television Tower Named Canton Tower". 30 September 2010. Archived from the original on 16 July 2011. Retrieved 5 October 2010. ^ 广州去年旅游业收入突破2500亿元. Feb 12, 2015. Archived from the original on 2016-10-21. Retrieved 2016-01-21. ^ "Mega Campus goes Wireless" (PDF). Intel Corporation. 2006. Archived from the original (PDF) on 27 February 2008. Retrieved 28 August 2008. ^ "New Guangzhou Library Opens". Guangzhou International. 2013-06-25. Archived from the original on 2013-07-06. The brand-new Guangzhou Library officially opened on June 23 after six months of trial service. ^ "Rare Collections". Sun Yat-sen Library of Guangdong Province. Archived from the original on 2018-01-18. Retrieved 2018-01-18. ^ "Guangzhou and Rabat sign sister city agreement". Archived from the original on 2 April 2015. Retrieved 17 March 2015. ^ "Gestiona Ecatepec oportunidades para intercambios estudiantiles con Guangzhou, China". Archived from the original on 2016-03-23. ^ "Relación México-Estados Unidos necesita puentes para construir paz, respeto y reconocimiento, no muros: EAV". Archived from the original on 2017-09-05. ^ "Viajarán a China alumnos de Ecatepec". Archived from the original on 2016-04-11. ^ "Gestiona Ecatepec oportunidades para Intercambios estudiantiles con Guangzhou, China". Archived from the original on 2017-09-05. An Anglochinese Calendar for the Year 1845, Corresponding to the Year of the Chinese Cycle Æra 4482 or the 42d Year of the 75th Cycle of Sixty, being the 25th Year of the Reign of Ta'ukwa'ng, Vol. II, Hong Kong: Office of the Chinese Repository, 1845 . Kuo, Ping-chia, "Guangzhou", Encyclopædia Britannica, online ed., Encyclopædia Britannica, retrieved 15 July 2016 . Ring, Trudy; Salkin, Robert M.; La Boda, Sharon, eds. (1996), International Dictionary of Historic Places, Vol. V: Asia and Oceania, Taylor & Francis, ISBN 978-1-884964-04-6 . "Guangzhou", Time Out: Hong Kong, London: Time Out Guides, 2011, pp. 284–300, ISBN 978-1-84670-114-6 . Bulletins and Other State Intelligence, Westminster: F. Watts, 1841 . Dutra, Francis A.; Santos, João Camilo dos (1995), Francis A. Dutra; João Camilo dos Santos (eds. ), Proceedings of the International Colloquium on the Portuguese and the Pacific: University of California, Santa Barbara, October 1993, Santa Barbara: Jorge de Sena Center for Portuguese Studies, University of California, ISBN 978-0-942208-29-0 . Gray, John Henry (1875), Walks in the City of Canton, Hong Kong: De Souza & Co.
Wills, John E., Jr.; Cranmer-Byng, John; Witek, John W. (2010), Wills, Jr., John E. (ed. ), China and Maritime Europe, 1500–1800: Trade, Settlement, Diplomacy, and Missions, Cambridge: Cambridge University Press, ISBN 978-0-521-17945-4 . The World in Guangzhou: Africans and other foreigners in South China's marketplace. University of Chicago Press. 2017. ISBN 9780226506074. Johnson, Graham E. (1999). Historical Dictionary of Guangzhou (Canton) and Guangdong. Lanham: Scarecrow Press. ISBN 978-0-8108-3516-0. Ng, Yong Sang (1936). Canton, City of the Rams: A General Description and a Brief Historical Survey. Canton: M.S. Cheung. ASIN B0008D1HHO. Shaw, Samuel; Josiah Quincy (1847). The journals of Major Samuel Shaw : the first American consul at Canton : with a life of the author. Boston: Wm. Crosby and H.P. Nichols. Retrieved 2008-04-05. Vogel, Ezra F. (1969). Canton Under Communism: Programs and Politics in a Provincial Capital, 1949–1968. Cambridge, MA: Harvard University Press. ISBN 978-0-674-09475-8. 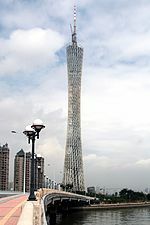 Wikimedia Commons has media related to Guangzhou. Wikivoyage has a travel guide for Guangzhou.